Russian Panslavist leader; born October 7, 1823; died at Moscow, February 8, 1886. Aksakov was one of the founders at Moscow of a circle of Slavophils, whose aim was to restore Russia to the position it had held in the days prior to Peter the Great —a position independent of all West European civilization. As a logical consequence, they were opposed to all the foreign elements in the population of Russia-Germans, Poles, and, above all, Jews. Though, at first, Aksakov showed some signs of a liberal attitude toward the Jews, he as early as 1862 protested in his paper, the "Den," against the admission of Jewish graduates to the civil service; but at that time he was willing to grant them full civil rights, including that of residence throughout Russia. 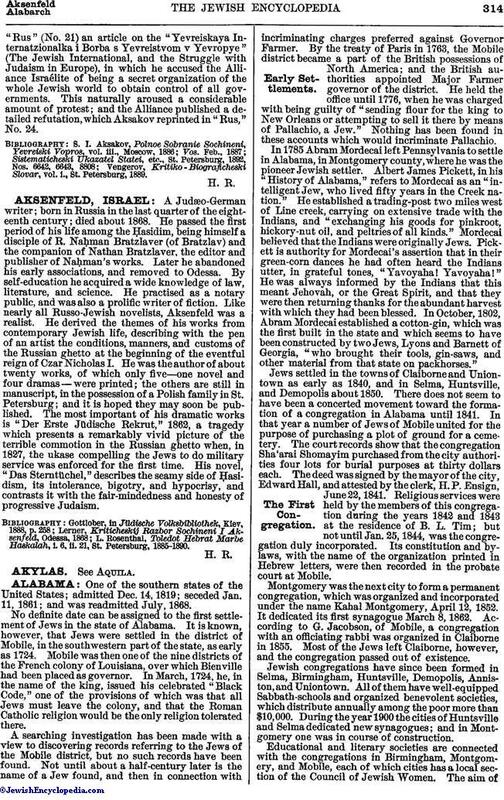 Later, his editorials in the same paper discussed the Jewish question from the religious (August 8, 1864) and economic (July 15, 1867) points of view. Aksakov's attention was again drawn to the Jewish question by the riots in South Russia in 1881; and he became leader of the reactionary movement which followed the death of Alexander II. He regarded the persecutions as a just revenge for the privileges granted to the Jews ("Rus," July 1, 1881), and vehemently supported the policy of General Ignatiev in promulgating the May Laws (ib. June, 1882). At this time Aksakov's influence was paramount with both the government and the press; and there is no doubt that his attitude toward the Jews assisted Russia in her stubborn resistance to the protest of civilized Europe and America against her treatment of her Jewish population. One incident of Aksakov's campaign against the Jews deserves to be particularly mentioned. In 1883 he published in"Rus" (No. 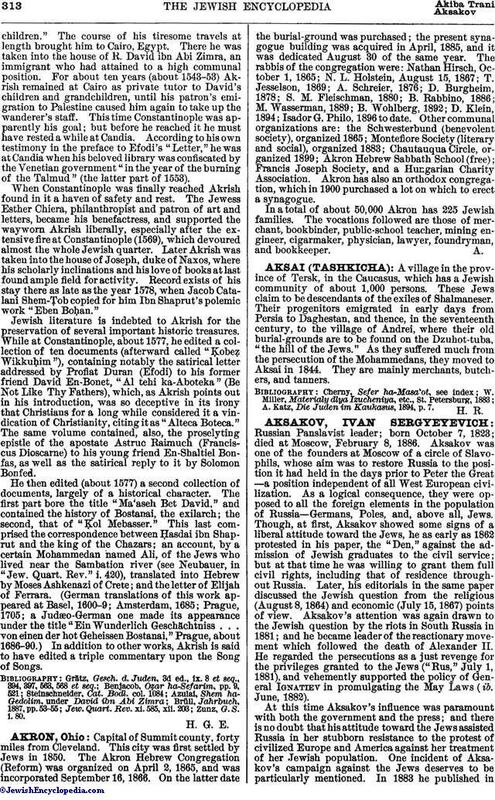 21) an article on the "Yevreiskaya Internatzionalka i Borba s Yevreistvom v Yevropye" (The Jewish International, and the Struggle with Judaism in Europe), in which he accused the Alliance Israélite of being a secret organization of the whole Jewish world to obtain control of all governments. This naturally aroused a considerable amount of protest; and the Alliance published a detailed refutation, which Aksakov reprinted in "Rus," No. 24. Vengerov, Kritiko-Biograficheski Slovar, vol. i., St. Petersburg, 1889.